Like most food bloggers, I am not without the occasional food obsession. Between walnuts, curly kale, kimchi and an alarming appetite for Peppermint Crisps, my obsessions of choice are as varied as they are peculiar. Currently, however, I can’t seem to get enough of brussels sprouts, so much so, I’ve taken to eating them by the veritable fistful. Thankfully, however, this particular obsession is one of my healthier food fixations. Widely regarded as one of the healthiest vegetables you can eat, brussels sprouts are packed full of nutrients (especially Vitamins C & K), protein and dietary fiber. Banting approved and suitable for those of us who are slaves to the LCHF lifestyle, ‘sprout are even reputed to have cancer busting properties. What more could you ask of the humble ‘sprout? Oh, and they just so happen to taste bloody amazing too! However, all that said brussels sprouts nevertheless remain a hard-sell. Bitter and cabbage-like, unfortunately ‘sprouts have always suffered from a bad rep. What, however, is the root of our collective loathing of this much maligned wonder-food? As with almost everything in life, you can probably blame your parents. Most of us bear the childhood scars of being force-feed our greens by well-meaning parents and (with perhaps the exception of the dreaded broccoli) arguably the most detested vegetable was the poor brussels sprout. When most of us think about the ‘sprouts of our youth, we remember them as part of a typical Sunday roast, invariably boiled to within an inch of disintegration. Is it any wonder most of us smothered them in gravy or fed them to the dog on the sly! Sadly, never has such a noble vegetable been treated so poorly and by so many. Whilst many of us remain understandably traumatised by our early experiences, I have actually come to enjoy boiled ‘sprouts and they are almost always part of my roast dinners. More recently, however, I’ve taken to sautéing my ‘sprouts and I have never looked back! Quick, tasty and incredibly healthy, shredding and sautéing your ‘sprouts is the ultimate way to enjoy this nutritious vegetable. A versatile side-dish, sautéed ‘sprouts go well with any roasted/grilled meats, sausages and burger patties, and whilst they are delicious just shredded and then lightly sautéed on their own, there are endless ways of jazzing up the dish. Add some diced bacon, red onion, mushrooms, red chilli; the options are limitless and all tasty. 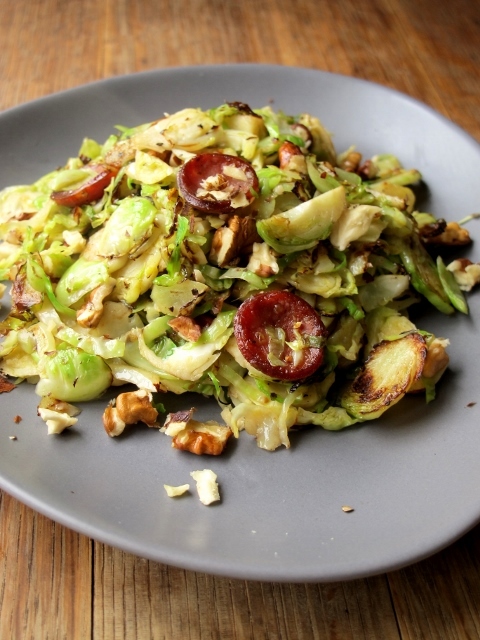 My personal favourite combination is with some chorizo, spring onion and walnuts – add a runny fried egg on top and you’d have my own personal cruciferous Banting-bliss on a plate!